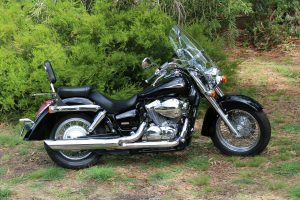 From around 1988, the Honda Shadow motorcycle has been gracing our roads, purring powerfully yet giving a relaxed ride. The earlier model known as VLX was a 600cc motorbike. Over the years, Honda has worked on its entry-level cruisers and maintained the power range to give adequate power on the highway while maintaining a comfortable ride. With every new design, the riding experience improves and the bike gets easier to ride. Honda Shadow cruisers made an attempt to reproduce the laid back experience from the 1950s vintage cruisers from the United States. Its low and stocky profile coupled with a relaxed rider triangle is the basis of the ultimate classic appeal. With its full-figured fenders, the Shadow violently enters the territory of the retro, and it’s chrome-covered triple tree and shocks accentuates that image. The Honda Shadow motorcycle has a seat height of 25.8 inches. This is very close to the bottom of the range, but it makes it close enough to the ground to make this cruiser an easy ride even for short riders and allows them plenty of leverage. The curb weight comes in at 549 pounds for the Shadow, and at that weight almost anyone can keep this bike under control, even during training, and without a struggle. Its steering head angles at 34 degrees projecting the forks away from the bike in a design suggesting the old school look, and this leaves the bike quite stable as well. This bike has a wheelbase of 64.6 inches with 6.3 inches of trail making it corner like you’d expect from a cruiser. You will love the Honda’s liquid cooled V-twin engine. Its a 745cc that moves this great bike on the open road with ease. The engine is near the square with 76mm stroke and 79mm bore. Its 5-speed gearbox channels the power efficiently down the driveshaft straight to the rear wheel very quietly in a low maintenance environment. The small engine sips gas giving an respectable mileage of 56 mpg. Depending on your riding style, you can expect to get about a 200 mile range. Its 34mm throttle body with PGM-FI handles the fuel management, and the automatic enrichening circuit will handle cold starting without the input from the rider. So, you don’t need to worry about the choke anymore. Its main competitor is the Indian with 1000cc though both engines sport a V-twin design. The Honda engine modestly blends into the background. Its 745cc engine is considered small for a cruiser, but this gives it the advantage of making the bike non-threatening to those who might be entering the big league for the first time. It may be small, but it still emits that V-twin sound. Its handlebars also reach back nicely providing a nice comfortable ride. The Shadow comes standard with drum brakes, but Honda also offers an option to upgrade the Shadow to include an ABS braking system. Since it is a low maintenance bike, the Shadow makes an excellent starter bike, especially for shorter riders or those with limited upper body strength. Both the Aero and Phantom models are priced at $7,499. This is a fair price for an entry-level model, and perfect for the budget-minded crowd. The ABS version comes in at a slightly higher price point of $7,799. As Honda keeps improving their bikes, the prices also keep moving north, but the bike keeps getting better and more powerful. The Honda Shadow is absolutely a serious machine that you will love if you are a cruiser fan. It rides smoothly on the highway with the 5-speed gear system, and it is easy on the gas, easily getting 56 mpg. It is designed to cruise along for hundreds of miles without heating up at all. You can comfortably ride it for 200 miles at highway speeds, and all without tiring your arms or body. It seats very low, which is an advantage for those shorter riders who have had challenges handling larger cruisers in the past. This motorcycle handles well and is light enough for a small person to handle without struggling. It does an excellent job capturing the essence of the 1950s without actually directly copying the designs of the past.